Captain Mark Kelly, who led NASA missions into space, will lead off the action-packed schedule of this year's Atlanta Science Festival on Tuesday, March 14. His talk is entitled "Endeavor to Succeed." Photo courtesy of NASA. The 2017 Atlanta Science Festival blasts off on Tuesday, March 14, with a talk by Captain Mark Kelly – commander of Space Shuttle Endeavour’s final mission – at 7 p.m. in Emory’s Glenn Memorial Auditorium. The title of Kelly’s talk is “Endeavour to Succeed.” Tickets for the event can be bought in advance on the Atlanta Science Festival’s web site for $12 ($8 for children 12 and under). They will also be available at the door the day of the event for $15. Starting at 5:30 p.m., during the countdown to Kelly’s talk, the public is invited to join toy rocket launching activities on the Glenn Memorial lawn, led by members of the Georgia Tech Ramblin’ Rocket Club and the Institute of Electronic and Electrical Engineers. Kelly, who began his NASA career in 1996, commanded the Space Shuttle Discovery, as well as the Endeavour. 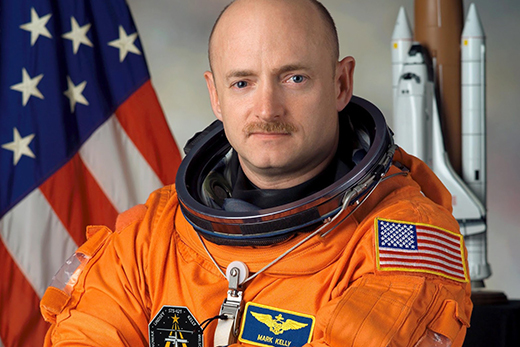 He left the astronaut corps in the summer of 2011 to help his wife, former U.S. Rep. Gabrielle Giffords, recover from gunshot wounds she received in an assassination attempt. The couple’s story captivated the nation, and they went on to found Americans for Responsible Solutions to advocate for gun control. NASA is comparing biological data from the Earth-bound Kelly with his identical twin brother, Scott Kelly, who recently spent a year in space. The unique Twins Study may offer insights into how to prepare astronauts for a long-term mission to Mars. Kelly is also a prolific author, including numerous children’s books with space themes, and he will be available for a book signing following his talk at Emory.